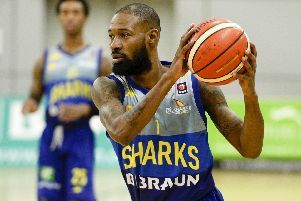 DBL Sharks Sheffield made it three wins in a row after edging Manchester Giants 77-72 at EIS Sheffield on Friday night. The Sharks went into the game on the back of an impressive win on the road in Newcastle last weekend and made a confident start to this one, Dirk Williams and Chris Alexander shining on the offense for the home side early on. A 15-0 run mid-way through the first quarter put the Sharks clear and seemingly on the way to a comfortable victory, however Manchester battled back in the second, a barren Sharks run which saw the Giants score 11 unanswered points being halted only by the half time buzzer, the score just 31-30 at the break. Despite Manchester’s pluckiness the Sharks stood up to the test - Mackey McKnight landing a couple of crucial lay-ups and Williams again at the heart of a 7-2 Sharks spell which stretched the score to 58-47 at the end of the third. The Sharks had to withstand some intense pressure in the dying seconds, Manchester bringing the deficit back to two points with seconds remaining. But the Sharks stood firm, with McKnight and Alexander landing some crucial free-throws to put the game beyond Manchester and secure the win. Head coach Atiba Lyons said: “I thought we came out pretty well and executed the offense but we didn’t score the ball very effectively and it caught up with us. “We had our moments but we just couldn’t put it together consistently. Sharks scorers: Williams 26, Alexander 20, McKnight 14, Wroblicky 8, Tuck 6, Marsden 2, Mitchell 1.